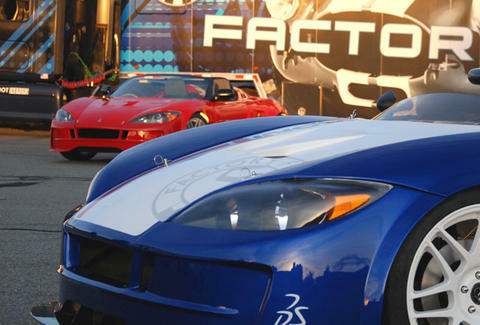 Having already established themselves as the go-to for Mustang- or Corvette-based kit cars, Factory Five Racing's just started production on Project 818: a Subi-based ride that continues their tradition of supplying gearheads with everything they need to turn junkyard parts into supercars, roadsters and classic Cobras. To help in corner-carving abilities, the complex double A-arm front/multi link rear suspension is formed from a combination of proprietary parts, base Impreza/WRX bits, and aftermarket goodies like Koni coilover shocks/springs. Wilwood brakes slow it down, while the Subi motor "gives excellent balance from being both low slung and mounted behind the drivers compartment". So the motor and your prom date should have fun swapping stories. This is their first car that's totally done by CAD, and the shell's being produced via a process called thermoforming to ensure a more perfect fit. The chassis itself is designed for both lightness (818kg, hence the name) and strength, with built-in rollover and side-impact protection. It's available with an optional powder coating, though if this were a Corvette, tradition would mandate that the powder be not optional.